Warning: off topic comment ! I see you were mentioned in Josh’s article in the NY times! (http://www.nytimes.com/2005/11/06/style/tmagazine/t_l_2156_remix_turnpage_.html) Unfortunately, it’s not linked – what’s up with that? 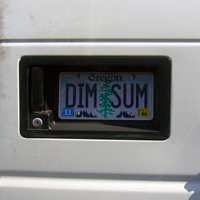 Hi Megwoo – you seem to have had a great time in Portland, I’m glad your camera had a break too ;) and am also glad that you took the picture of the number plate… isn’t it great? Yes, I had a great time in Portland—it’s so nice to get away for the weekend. I was actually going to email you for suggestions but since my friend used to live in Portland I decided it would be fun to see what he came up with. Your tip sheet is great though, I’ll definitely print that out for my next visit. Thanks! Someone was actually telling me about Nostrana. Can’t wait to check it out. I can assure you that putting crispy pepper bacon on anything will win you points in my book! I will definitely be in next time I’m in town. I made tempura bacon at home—you’re right, it totally changed the flavor and texture of the bacon, but I actually kinda liked it! There’ve been some major downhill reports on Nostrana lately, but it’s hard to tell if it’s just growing pains as it’s still been only about a month that they’ve been open. Extramsg, Oh that’s too bad. But yeah, it’s so hard to tell with a new restaurant. I probably won’t get back down to Portland for a few months, so I’ll check in with you for the scoop before I go! meg- do definitely check out sagittarius the next time you’re in portland. i think you’ll really like it. mmm, bacon. Thanks Myrrh! Yes, Sagittarius will be a definite stop next time I’m in Portland… which will hopefully be sometime soon!